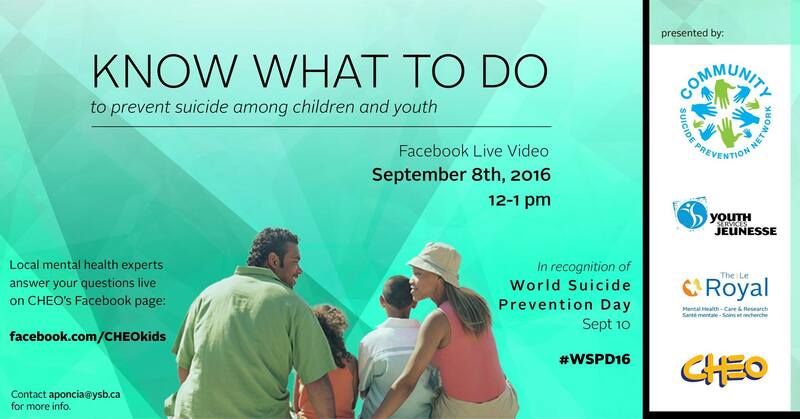 Today from 12:00 to 1:00 I will participate in the World Suicide Prevention Day Facebook Know What to Do Event. The event will be hosted on the Facebook page of the Children’s Hospital of Eastern Ontario (CHEO). As well as answering participants’ questions, I have a short presentation to make on talking to your child about suicide. When I considered what to say, I realized that the most important thing for a parent to remember when they have a suicidal child is: Suicide attempts and suicidal thoughts are symptoms of serious illnesses. They are caused by many different factors. Talking about suicide with your child cannot give your child the idea to attempt suicide and so parents should never worry about raising the issue. This is important for parents, and, in fact, for all of us to remember since stigma and blaming oneself are still more implicated in suicide that the fact that it is the outcome of a serious illness. Because suicidal thoughts and suicide attempts are symptoms of an illness, I encourage parents, friends and others to ask youth about suicide when they are worried that a person may be suffering from ideas of taking their own life. Indicate your concern and your wish to help. A young person contemplating suicide needs to understand that you care about them, that you love them and that you’re going to do whatever they need you to do to get them help. I advise parents to ask a young person how they can help. Offer to do whatever the young person needs and be prepared to follow through. If a young person is reluctant to talk to you, find someone they will talk to. It is important for us not to judge suicidal thinking – it is the symptom of an illness. Ask over and over what you can do to help. Remember that statements such as, “You have so much to live for” or “Think how this will affect your family” are not necessarily helpful to a person with the despair that is another symptom of depression. Suicide and suicidal thoughts are not wrong – they are the symptom of an illness. As I write this, I am reminded of the many young people I have cared for who suffered with mental illness and suicidal thoughts for many months and even years before treatment began to be effective. I see their troubled faces first and then their smiling faces once they were feeling better. I work with a great team of social workers, psychologists, other psychiatrists, nurses, teachers, child and youth workers, recreation therapists, occupational therapists and experienced managers and office staff. We have teams at The Royal, at CHEO and at Youth Services Bureau. We all work together to provide the treatment that is needed for serious mental illnesses and to prevent suicide.